"And here's where we'll build the swimming pool!" Once upon a time, Russia and the United States were bitter enemies in pretty much all aspects of life. From sports to space exploration, the US and the USSR were neck-and-neck in their fight against one another, but not anymore. With the fall of the Iron Curtain and the democratization of Russia, two former enemies are fast becoming allies. The Russian Federal Space Agency, NASA, and the European Space Agency are actively working to team up to start either a manned lunar colony or a lunar space station to facilitate exploration of our closest galactic neighbor. 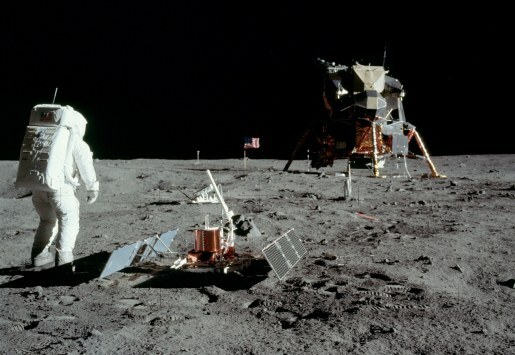 It has been 40 years since man last set foot on the surface of the moon. In 197s, Apollo 17 astronauts Eugene Cernan and Harrison Schmitt spent 3 days on the moon, but since then NASA has had other priorities. Not anymore, if Russia gets her way. Then again, if the US won’t help, maybe Japan will. After all, they already have a Domino’s Pizza willing to delivery to the moon, so now’s the time to tap into that enthusiasm and get some funding help.